Nick Eaton is the General Manager of Insulation Services and Solutions (www.insulationsands.com). With more than 15 years of industry experience in the commercial construction and insulation fields, Mr. Eaton has managed several difficult and labor-intensive projects for high-profile clients providing turnkey insulation and sheet metal lagging services. He can be reached at NEaton@insulationsands.com. The city of Bridgeton, Missouri, recently completed construction on a new 56,000 square foot recreation center featuring an enhanced indoor pool, larger fitness center, dance center, indoor walking track, on-site child care, gymnasium, meeting rooms, and other features. Members of the Bridgeton Community Center have access to this new facility and the various classes and activities it offers throughout the year. When constructing this new facility, the building planners made it a priority to have the mechanical insulation professionally specified and installed by an experienced mechanical insulation contractor and National Insulation Association (NIA) member, Insulation Services and Solutions, LLC, a full-service mechanical insulation contractor specializing in both commercial and industrial projects located in St. Louis, Missouri. The 3,000 square feet of round supply air ductwork was insulated with 1.5-inch thick 1# duct wrap. The 10,000 square feet of supply and return air rectangular ductwork was wrapped with 1.5-inch thick 3# density FSK board. This versatile insulation board is ideal for ductwork due to its thermal and acoustical benefits. These benefits include thermal efficiency, which results in lower operating costs; easy installation, resulting in lower labor costs; noise reduction from the board‘s acoustical properties; sustainable material that recovers the energy it took to make the board within a few days; and a vapor-retardant, FSK facing that provides a pleasing appearance. Each of these components was specifically selected by the mechanical contractor for optimal performance under the environmental factors in the facility. Buffa affirmed, “Identifying and preventing mechanical insulation damage can often be difficult due to the many different types of insulation available and varying indoor and outdoor environments. 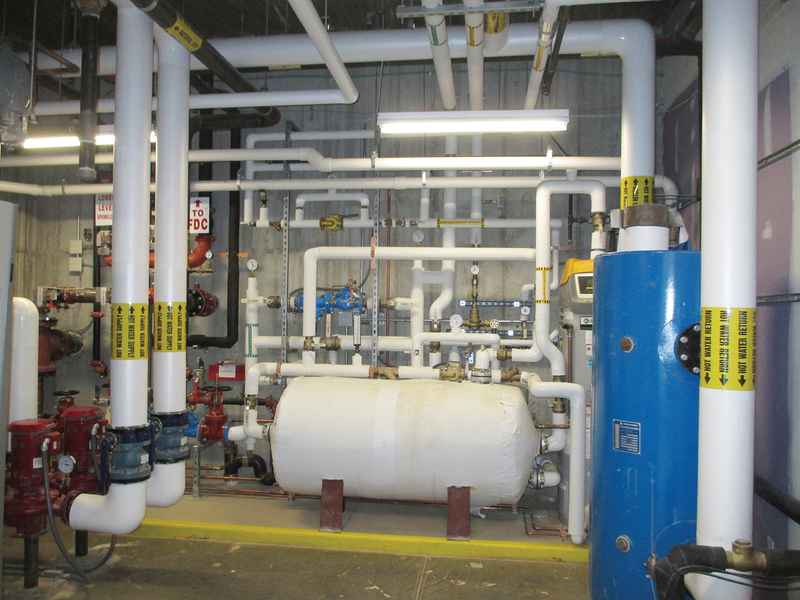 If mechanical insulation is not properly installed and maintained, the facility is at risk of various types of damage that may not be obvious to a facility manager or owner. It is important for facility managers to make time for a thorough inspection before installation to avoid inconvenient and costly repair and replacement fees at a later time.” The specific material used in the project is UL GREENGUARD Gold Certified, which is UL Environmental validated to be formaldehyde free and contains less than .10% decabromdiphenyl ether (DecaBDE) by mass. Installing products that have these certification standards ensures that chemicals are not affecting the indoor air quality during the system‘s use. Also, the facings on the insulation board will not accelerate corrosion of aluminum, steel, or copper. The water vapor transmission rates for the FSK board and ASJ have a maximum of .02 perms, resulting in the resistance of mold, fungi, or bacteria growth. All these environmental factors played an important role in insulating the facility. The schedule of the project, which lasted from July 2015 to October 2015, was met with ease due to a professional installation by an insulation contractor and their thorough schedule-management techniques. The new Bridgeton Recreation Center, which opened in January 2016, will now benefit from a professionally-installed insulation system covering important pipes and ducts within the facility. The correct specification and installation of insulation products will lower utility bills, regulate the temperature of the building, and decrease the chances of costly damage to the insulation system over time.